SPCA has recently offered to help Second Chance rehome our pups through a weekend arrangement (there are just too many at the shelter at the moment and we are very thankful for this assistance from SPCA). 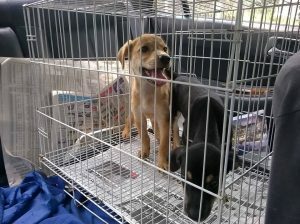 We are to bring a few healthy pups (at least 1 vaccination) to their Ampang Centre on a Saturday and if the pups are not adopted, we bring them back on Sunday evening. So here we have 2-month-old Roy (the cream coloured) and Rosa (the black coloured) waiting at the SPCA Selangor, Jalan Kolam Air, Ampang for their forever homes. They will be there till this evening. 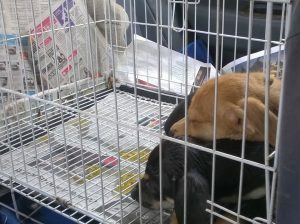 It was a half hour long journey for them to travel from Hulu Langat shelter and they vomited along the way. Poor lil’ ones. Praying you find good homes soon! Please call 016 3323382 if you need any information about them.